A year is a long time in Russian politics, and Vladimir Putin isn’t the same man he was a year ago. Then — on July 15, 2011 — he visited Magnitogorsk, presided at the official commissioning of the new automotive steel production line known as Mill-2000, and spent three hours answering questions from the workers of Magnitogorsk Metallurgical Combine (MMK). 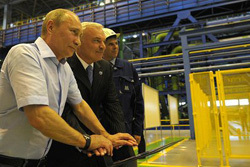 This Monday, July 16, Putin was back at MMK, pressing the button alongside MMK owner Victor Rashnikov to inaugurate two sub-sections of a sub-production line. The Kremlin has (so far) released no record of what was discussed with the steelworkers. Rashnikov is also a changed man. In between the two Putin visits, Rashnikov attempted to invest half a billion dollars of MMK’s cash, and $1.5 billion in borrowed money, some of it from a state-controlled Russian bank, in an Australian iron-ore mining project known as Flinders Mines twelve thousand kilometres away. Then in late March Rashnikov suffered an abrupt loss of will and change of mind. Twelve weeks later, at the start of July, he formally withdrew from the entire scheme. Not once did Rashnikov explain what he was doing. Putin didn’t mention this farfangled idea yesterday, nor did Rashnikov. Nor is the Kremlin transcript of Monday’s proceedings a fraction as fulsome as it was a year ago of what Putin, Rashnikov, other steelmakers and MMK workers had to say to one another. One thing is clear, though: if Rashnikov hadn’t abandoned the Australian project at the start of this month, Putin isn’t likely to have joined him for the button-pressing, bestowing fulsome congratulations on the MMK owner for what Putin described as his “very decent” investment record. Here is what Putin, then running for election as president, had to say a year ago. And here is the Russian-only Kremlin transcript of a small part of what was said yesterday, with more promised. Time has proved Putin was misadvised, and was misjudging the economic cycle. At the moment, domestic demand for construction steel is so weak that MMK’s peers, major steelmakers like Novolipetsk and Evraz, are cutting production, although they prefer to explain this as due to repair and maintenance schedules, not lack of buyers or state budget procurement funds. Pipe demand has been falling this year by more than 30% compared to a year ago because Gazprom and Transneft aren’t buying. At the start of the month, Gazprom made this official – this year it will buy 1.4 million tonnes of large-diameter pipes for the pipeline projects Putin mentioned. That’s 36% less than Gazprom bought from the Russian pipemakers last year. They in turn cannot continue buying wide steel strip from MMK’s Mill-5000 if there is no point in turning it into pipes Gazprom doesn’t want. Putin opted not to address this problem yesterday, at least not in the public transcript. Had Putin been shown the production report from Evraz for the second quarter ending June 30, he would have registered that its Russian steelmills produced 11% less steel compared to the first quarter. The Evraz forecast for the current quarter is for another 3% cutback. Likewise, a few days ago, Novolipetsk Metallurgical Combine (NLMK) announced it is shutting down one of its blast furnaces for at least two months and will cut its steel volume for this period by 6%. Is Rashnikov promising Putin he will not cut production? Did Putin extract such a promise? The transcript indicates that both of them were avoiding the point. Six months ago, in the last stretch of the presidential election campaign, it was another story. Putin’s then deputy for the metals industry, Igor Sechin, called the steelmakers into a series of meetings and told them the government’s competition, work safety and environmental control regulators wanted to see hefty investment commitments in each of their areas, and once the targets were fixed, the regulators would police them.